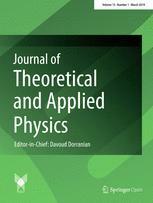 Journal of Theoretical and Applied Physics is a single-blind peer-reviewed open access journal published under the brand SpringerOpen, covering all aspects of physical science. It is fully supported by the Islamic Azad University, who provide funds to cover all costs of publication, including the Article Processing Charges (APC’s) for all authors. Therefore the journal is both free to read and free to publish in. The journal's high standard and wide dissemination ensures a broad readership amongst the physics community. Rapid publication times and flexible length restrictions give Journal of Theoretical and Applied Physics the edge over other journals in the field. Publishing in this journal is completely free of charge.